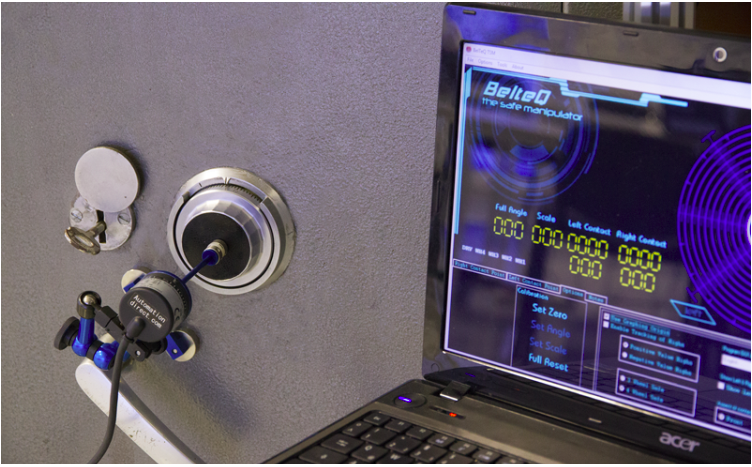 The TSM is probably the most advanced safe lock manipulation aid available. A product with a long history, the TSM is the latest version of the V2 / V3 manipulation aid. Fully updated with new hardware for modern laptops. Wheel placement – the placement of all wheels is shown & constantly updated in the GUI. Graphing. All graphs are drawn by the TSM – to an accuracy of 1/40th of a number. Quick and easy setup, simply superglue the encoder coupling to the centre of the lock dial. Attach the rotary encoder to the coupling and connect to a standard USB port of a laptop. Laptop must be running Windows XP or later to support the TSM software. With this tool and some practice to develop consistency of contact point placement the process of manipulation can become straightforward. I have personally used this tool to open dozens of locked-out safes.